Classics Department founder and chair Dr. Randy Todd received the John H. Buchanan Award for Excellence in Classroom Teaching during Samford’s opening convocation of the fall semester Aug. 28. "He has built a robust major, attracted outstanding students and faculty, and played an integral role in developing a classically-oriented core curriculum," said Creed, adding that Todd "conveys a contagious enthusiasm for the literary and cultural achievements of the past." More students are enrolled in Greek and Latin courses at Samford than at many schools five times its size, he said. 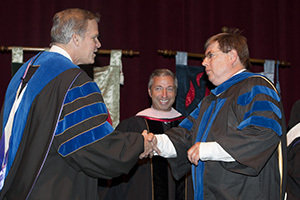 A Phi Beta Kappa graduate of Furman University, Todd holds a Ph.D. from Vanderbilt University. He and his wife, Dr. Candy Todd, who teaches in the Samford mathematics department, have four children. The Buchanan Award includes a silver tray, a lapel pin and a $1,000 cash prize. Finalists for the award were nominated by members of the 2012 graduating class.